…though those of our readers who had LSU to cover that 13-point spread might very well be disposed not to hear anything other than what a bum LSU’s starting running back Nick Brossette, who in 10 games so far has rushed for 792 yards and 11 touchdowns, proved himself to be Saturday night in Fayetteville, Arkansas as the Tigers won a humdrum 24-17 decision over the SEC’s worst team. We’re talking about three plays here. The first was Brossette’s 16 yard run on 2nd and 8 from the Arkansas 23, a play which put the game to bed for all practical purposes. LSU had been in total control of the contest, though ahead 24-3 and with a couple of significant injuries in the secondary (already down starting free safety John Battle, first Battle’s backup Todd Harris was injured and then starting cornerback Kristian Fulton went down; Harris did return to the game) the Tigers gave up 151 fourth quarter yards and a couple of touchdowns to bring the game within seven points. But when Brossette raced inside the 10 before sliding at the seven, there was only 1:36 left on the clock. They didn’t have to run another play to secure victory. And without scoring, LSU had the ability to hold the ball and keep Arkansas from ever getting it back. A score meant kicking off to the Hogs, who could – mathematically, if not realistically – score to bring the game back within seven and then get the ball back with an onside kick to give themselves a chance at throwing a Hail Mary pass against a depleted LSU secondary to tie the game. Was this a real possibility? Not especially. But it was a possibility nonetheless. So what players are coached to do in Brossette’s case at issue is to slide after getting the first down, keep the clock running, and get off the field with a win. Where things got weird was what happened after that 16 yard run. Brossette got another handoff and there was again clear sailing to the goal line. Again he slid. And then another handoff on the game’s final play. What makes this look so strange is that LSU didn’t go into victory formation and just kneel after the snap twice. That would have run the clock out and it would have made perfect sense. LSU coach Ed Orgeron said after the game that the third Brossette handoff was the team making the decision to go ahead and try to get that last touchdown. And if you think about it, that’s defensible based on the two earlier Brossette slides. By then, there were less than 30 seconds on the clock – hardly enough time for Arkansas to go down the field once and score a touchdown, much less twice. It was then safe to try for a touchdown; the only possible disaster would have been for LSU to fumble and Arkansas to execute a 95-plus yard scoop-and-score. That possibility would normally be enough to occasion a coach to use the victory formation. Orgeron was perhaps willing to make those among the Tiger fan base who wager on football games happy, and got burned for it. Of course, the fact Arkansas gave up rush yardage so easily to Brossette on the two penultimate plays of the game might be a signal that they were looking to give up a score in exchange for the football. Sliding on those two plays denied them that. The real complaint about Orgeron’s game management shouldn’t come from those two slides. 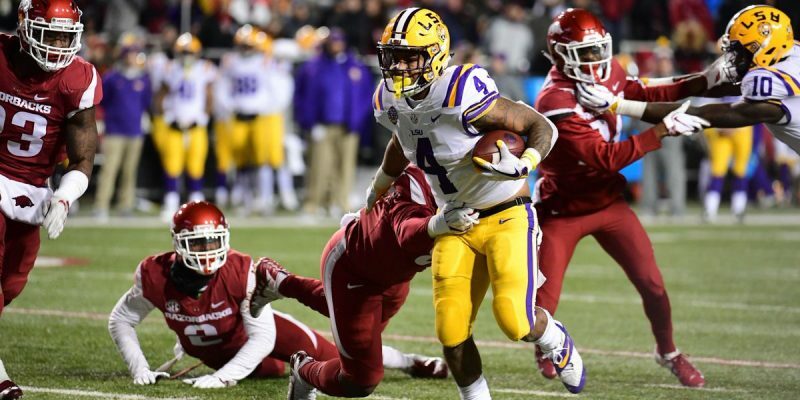 If there was a mistake in decisions made on the sideline Saturday it came with about seven minutes left, with LSU sitting at Arkansas’ 25 yard line with a 4th and 1. Orgeron could have had a field goal from his Mr. Automatic placekicker Cole Tracy that would have made the game 27-10 at that point – and with a three-score lead the Tigers would have all but salted the game away. Instead, he got greedy and went for it – and when quarterback Joe Burrow made a bad read on a zone-read option play and handed the ball off to Clyde Edwards-Helaire for no gain rather than keeping the ball for an easy first down run, the Tigers turned it over on downs. Arkansas then went down the field in only 1:33 to score, thanks to a stupid unsportsmanlike conduct penalty on Kary Vincent on a 3rd down from the LSU 47 yard line and a subsequent 32-yard touchdown pass to tight end Cheyenne O’Grady. Instead of 27-10, the Tigers were only ahead 24-17. The drive culminating in those slides by Brossette was actually a thing of beauty, as LSU rattled off nine plays, including three first downs, and ate up the final 5:27 on the clock to put it away. But since it didn’t end with a touchdown to beat the spread, nobody is particularly happy about how things turned out, and Brossette is, unfortunately, catching undeserved hell from some quarters for sliding. Including some morons who think this was proof he was shaving points. LSU is a 44-point favorite over hapless Rice this Saturday. If you bet on a spread that big and somehow Orgeron doesn’t cover it, that’s on you. Not him. Though we won’t be surprised at all to see (1) loud screeching if Orgeron shuts things down before beating the number or (2) knowing that, if Orgeron has his starters in and his game plan fully engaged long after the game is decided in an effort to shut up his critics.